RJ452 - Celtic Cross Earrings - Solid Pewter. Each tiny cross is 7/8 inch tall. The crosses dangle from stainless French ear wires. These are so lovely the photo just does not do them justice. These earrings will not pull on your ears and you will find you can wear them all day! Check our other catalog items for a matching pendant. 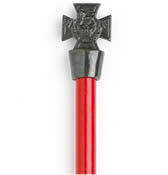 We offer a number of Celtic crosses for sale.